Passionate about fitness, nail polish, Disney – Cinderella, sewing, Min Pins, firearms, cleaning, church, Batman, family history, America, and my husband! 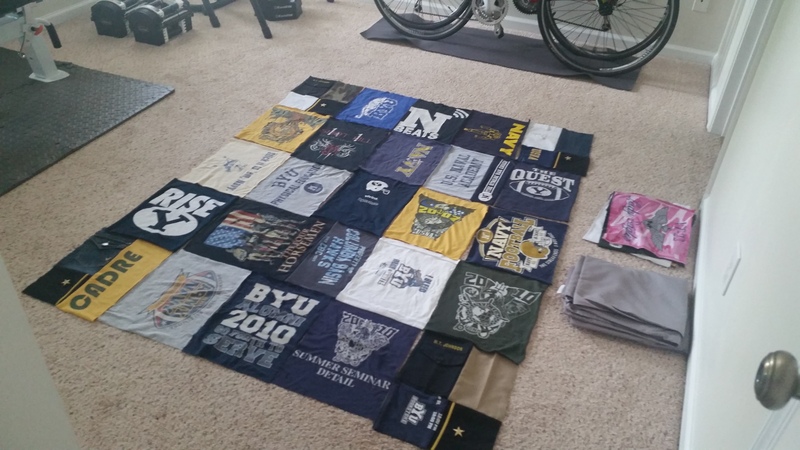 Once I had all the shirts cut and sized, I played with the layout of the shirts. And no, I did not use any stabilizer. I wanted my quilt really soft. There are people who have to use stabilizer and those who don’t care. I find there are pros and cons to both. For my next shirt quilt, I will try and use stabilizer. I think my quilt turned out perfect without it though. Next I had to start sewing the shirts together. I sewed them by rows first. Then I sewed the rows together. Then I made a border with my sheet. It was a Cal king sized sheet and so there was plenty of fabric. You can click HERE to see how I did it. 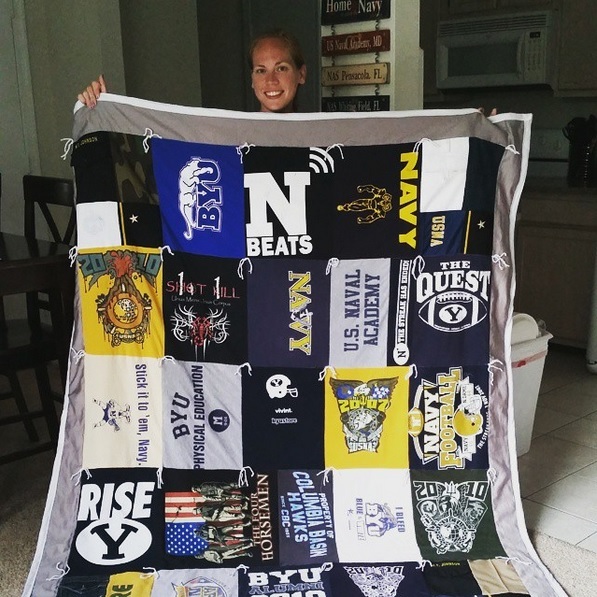 It actually is a great way to make your quilt even. When sewing shirts/blocks together the quilt can become uneven. Once they were sewed together I cut my batting (I used cheap polyester low loft batting from Walmart). I cut it a little bigger than the shirts, basically a few inches of the batting was sticking out from the edges. I also cut my old sheet (back of the quilt) the same size. Then I made the quilt sandwich. This is where you put all your layers together and use your safety pins to make is stay and thus… start the quilting process!!! I actually sewed around the edges (where the silver border and shirts meet) of my quilt to make sure it wouldn’t come apart. Then with my yarn, I quilted it. Then I cut the edges of the quilt sandwich to make it all uniform and even. Last I sewed on my nice white binding to put it all together. Throughout the entire quilt, I did use a 1/4 inch seam allowance. There are plenty of tutorials on Pinterest on how to do each individual part of the quilt, if you need assistance. The part I needed the most help on was adding the border to even out the quilt. It isn’t perfect, but that’s what makes it a quilt! 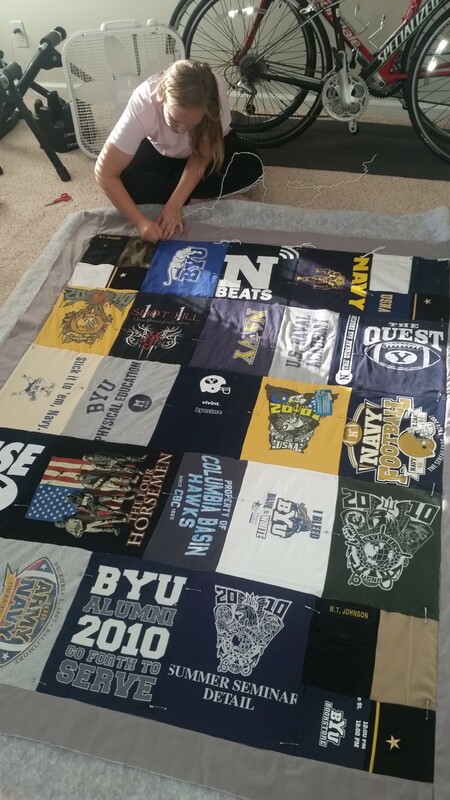 Posted on June 30, 2015, in Craft Projects and tagged bedding, binding, Brigham Young University, BYU, college, crafts, cutting, diy, do it yourself, Naval Academy, quilt, sew, sewing, shirt quilt, USNA. Bookmark the permalink. Leave a comment.